The Whelk encrusted ‘Shellman’ of the Folkestone old town is an obscure and little documented ritual, prevalent in Folkestone during the period between the wars. Although it almost certainly pre-dated the Great War, little of its original purpose can be found in contemporary recollections . The custom is associated with, but separate from, the town’s annual Fair. The meaning of the character has long been forgotten, but it has been the cause of much speculation amongst fishermen and the fishing community. It is sometimes said that the custom was first recorded in 1887 (when the right to collect the shells from the inner harbour was originally granted to a local fisherman’s representative), but it is widely believed to be much older. The ceremony consisted of a group of fishermen and their families enacting a mock discovery of hidden treasure on Folkestone foreshore, and a presentation of the found ‘treasure’ to the children of one of the fishermen. 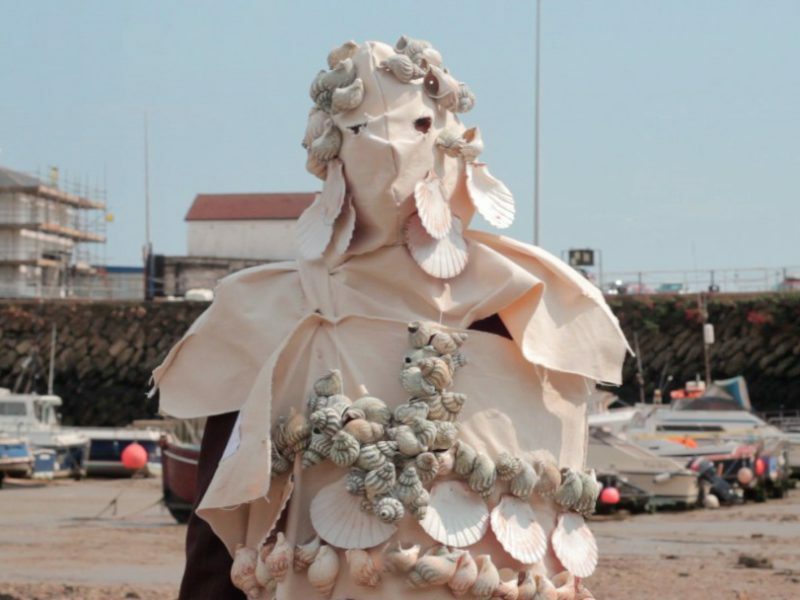 The whole ceremony was presided over by a character adorned head to foot with shells and sailcloth, and marked by his speech in non-sense rhyme, ‘clacking’ his knees together to emphasise the rhythm of his speech. None of the content of this speech is recorded, except for the final line, which apparently contained a bawdy variant of the child’s tongue twister ‘she sells seashells on the seashore’. in ‘Folklore of the Southern Counties of England’, 1957.